These tops are flashier in person as the silver is silver lame or metallic so it is sparkly. 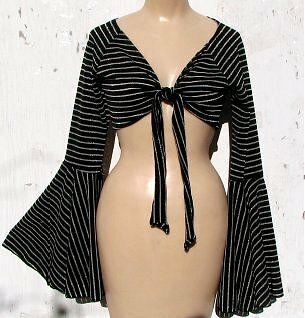 The lightweight polyester knit crop tops have wonderful large belled sleeves. The tops tie in between the chest so they are somewhat size adjustable, although they do come in sizes. They are perfect for a theme party and would match silver or black bottoms. They also look good tied over a black or silver dress, jazzing it up. These can be machine washed on gentle or hand washed.